Help with composition with terraced stream course. My house is built on a small hilltop. I terraced the hill with 2 stone walls about 20 ft. apart, 4 ft. tall on average and 70 ft. long. There is a 1/4 acre or so farm pond at the bottom of the hill. I feed a small pond behind the house from this pond it overflows the top wall and collects ina stonelined basin about 5' X 10' this is the start of a stream course that follows the base of the wall for about 30' it then turns 90 degrees and drops down three sets of small falls as it works its way around the lower wall back to its source the farm pond. I need some composition help with the planting scheme. I just bought some junipers and mums late this fall. after looking at the pitiful atempt I came up with thought "I need help"
That's quite a project you did! I'd like to share some thoughts and I have some questions as well. It would be most important to know your hardiness zone so the plants we suggest will survive your winters. 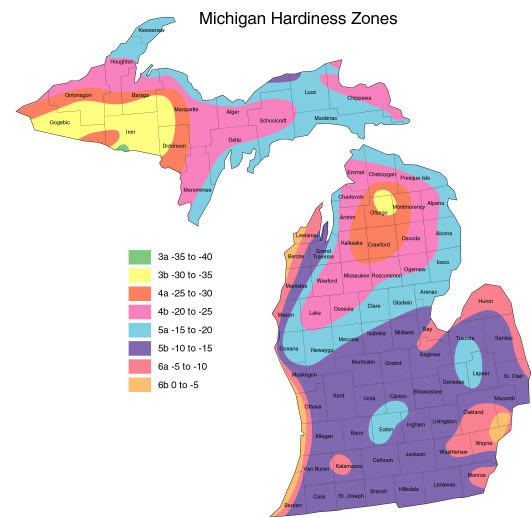 SW Michigan has zones 5 and 6. Here's a map and zip code zone finder. The next thing that would be important to know is the sun conditions. You say you planted mums, so I'm thinking that the area gets 6 hours of sun or more. Shade - 2 hours or less of sun. What type of look do you want and what do you want to accomplish? Do you want woodland plants, native plants, formal look, lots of color (works best in sunny areas), feed wildlife (any in particular? ), are deer a problem where you are, do you want to do alot of fussing with the area or let it look 'wild', will it be viewed mostly from above or below, etc? I see a greenish area in the middle of the upper wall. Is that a waterfall/grotto and what I'm seeing is alagae on the rocks? Where is the stream in relation to the walls I see in the picture? Which junipers did you plant? Let us know and we'll try and help you select some plants. hi Newt thanks for help.. My zone is right on the edge of change 6a, 6b, &5. I live about 4 miles from Lake Michigan about 20 miles north of Indiana. The Stone walls face east and the area I'm wanting to work on gets full sun (What we in Southwest Michigan call full Sun ) until 1 or 2 Oclock. Im looking for something as natural as I can get. We have no shortage of deer, rabbits, squirels and that sort. I don't mind them doing there thing as long as I can choose plants that work in this enviroment. Im looking for plants to plant along the stream course, I would like some type of perenials to plant along the top of the wall that may drape flowers over the wall. also some sort of plant that might work as a good anchor point to the left or both sides of the catch basin where the large waterfall comes over the top wall. (the green spot) Algea has gotten extreemly unbearable this last summer. I had the old farm pond cleaned out 3 years ago it had alot of black silty soil pulled out. I thought with my pump turning the entire volume of water over in the larger pond in less than 24 hrs. would oxyginate the water well enough for Enzymes to do their duty. But the string algea and watermeal was so bad it looked like you could walk on the water.(prob. a diff. forum) the whole Idea of this stream course was to filter and airate the pond. Im going to add abottom bubbler in spring.I would like to work on plant layout this winter. Gurdy, you are so very welcome! My zone is right on the edge of change 6a, 6b, & 5. I'm a bit familiar with the area as my daughter used to live a mile from the lake in Illinois. Try the zip code zone finder. You may also find it a bit warmer since you are in a hill. Warm air rises and the valleys tend to frost and be colder then up the sides of a hill, especially when facing the sun. You also have the rocks to hold in the heat and generate it out at night. So you might be able to 'cheat' a zone near the stone. Before we start, Michigan has a Landowner Incentive Program (LIP) that you might qualify for. I would definitely consider natives. Here is a list of native grasses and sedges. From that list I would recommend these for along the stream. Cotton Grass - Eriophorum virginicum will do well in a boggy area that tends to stay wet, if you have such an area. Little Bluestem - Schizachyrium scoparium will grow in nice clumps and be easier to control. Junegrass - Koeleria macrantha shouldn't overtake the area. Switchgrass - Panicum virgatum makes great cover and food for ducks and small mammals. Tussock sedge - Carex stricta will grow in nice clumps in or out of the water. The second site has others I would recommend or have recommended EXCEPT Iris versicolor - blueflag iris. That can take over the pond, your neighbor's yard and on. I had some in a pot in the ground and it split the pot and kept going! Pennsylvania sedge - Carex pensylvanica will creep and form a colony. Liverwort - Conocephalum conicum doesn't bloom and you can probably find some on the forest floor to transplant near your stream in a moist shady spot. It would look wonderful growing on the rocks where you now have algae. The female plants will get an interesting umbrella-like stalk. The Jacks above look nice interplanted with Marsh marigold - Caltha palustris. For your pond any of these natives would be just fine. Do be certain to keep the Golden Club in a container as it can be a bit invasive in the mud. I would like some type of perenials to plant along the top of the wall that may drape flowers over the wall. Geranium 'Rozanne' is one of the longest blooming hardy perennials I can think of. If you plant it near the edge of the wall it will drape over. It can take full to part sun and blooms in my daughter's zone 6/7 garden from June to hard frost. It's not a native geranium but it's not invasive. You can see it spilling into a walk in the first picture and over a pot in the second pic. It will grow to about 3' wide in just a couple of years if it's happy. There are many sedums, some that grow upright and others that are a great groudcover that will grow over the wall and even root into the spaces between the rocks. Each plant only spreads about 1' to 2'. Arabis caucasica - rock cress is not native but will grow in and around the rocks and cascade over a bit. The second pic is without the flowers. Bearberry aka Kinnikinnick - Arctostaphlos uva-ursi is an evergreen native that will grow about 10" tall and 3' to 5' wide and cascade over the wall. It offers berries in the winter too. Gaultheria procumbens - wintergreen is another wonderful native evergreen shrubby groundcover that will cascade over the wall and feed wildlife. If you look closely at the last link you will see it over a wall. Mitchella repens - partridge berry is another woody evergreen native with berries but will need some shade if you have a shady spot. It roots along the ground. Do you want a small tree such as a weeping Japanese maple, a shrub or an herbaceous perennial? Algea has gotten extreemly unbearable this last summer. Consider barley straw for algae control. Once you finish your 'homework' get back to me and I'll see what I can come up with for the top of the wall at the waterfall. Thanks very much for the valuable info on the "natives". Youve given me some fantastic ideas on plants I hadn't thought of. I do really need help in the composition of the plants I use. If you note: I have a slope to deal with along the stream at the base of the upper wall. the terrace between the walls is what I'm working on first. I imagine we will fill most of the sloped area with some annuals this spring. but I guess I'm looking for a good book that might teach me the ABC's of design and composition of area gardens. I'll try to add Photo's. Gurdy, glad you found the info on the natives helpful. I must have misunderstood though as I thought you wanted to landscape the area around the stream. Sorry about that. What did the zip code zone finder tell you for your zone? I have a slope to deal with along the stream at the base of the upper wall. the terrace between the walls is what I'm working on first. I'm thinking that is the 20' by 70' area that I see that is mostly dirt. We never discussed if you added anything to the soil for that area. Whatever you are going to plant, I would suggest a 3" layer of compost mixed into the soil to aid in drainage and add some good microbes for your plants and the soil, especially if it's going to be bare all winter it will need it. Here's a compost calculator and a mulch calculator for when you plant and then mulch. ...I guess I'm looking for a good book that might teach me the ABC's of design and composition of area gardens. I'm not sure which books to recommend, but a trip to the library to look at books on woodland gardens, natural habitat gardens, native plants for your area, wildlife gardens, terraced gardens, gardening on a slope, etc would probably be helpful. Hopefully someone else will come along with more book and/or author ideas. Some of my favorite authors are Ken Druse, Barbara Damrosch and Michael A. Dirr. "A Garden for Life: A Natural Approach to Designing, Planting, and Maintaining a North Temperate Garden" by Diana Beresfor-Kroeger. Gordon Hayward is another author that you might enjoy. You can poke around his site here.